U.S. foreign policy can help support the American economy, writes Ambassador M. Osman Siddique. In an era of profound shifts and challenges in the global economy, how does the United States assert leadership in its foreign policy? We must of course maintain the defense capability to protect ourselves and our national interests. But as recent misadventurous wars have demonstrated, military strength alone does not protect American interests or American lives. To maintain (and, in too many cases, to restore) our leadership, we must also make ourselves indispensable economic partners. While shared ideals and mutual respect connect nations, what brings nations together often are powerful economic ties. I have seen this firsthand while serving as a U.S. Ambassador, and throughout my career as an international businessman. As secretary of state, Hillary Clinton knew this, too. She recognized that strong and long-lasting relationships between countries are not formed through isolated agreements. Rather, they endure when both parties involved are seeking greater respect, greater value, and greater confidence in what can they can accomplish together. One of the many examples of this work is a deal she helped secure between Boeing and Indonesia’s Lion Air. 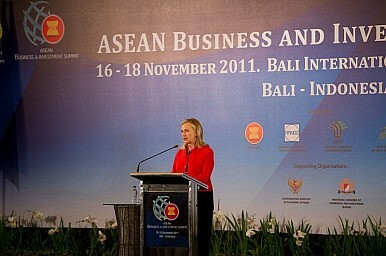 Secretary Clinton encouraged Lion Air to purchase 240 new jets from Boeing, for a total of $21.7 billion. After this deal was secured, President Obama estimated that it would create over 100,000 new jobs in the United States. These are not short-term contracts, but rather jobs that will sustain hardworking American families for years. Her economic diplomacy went well beyond supporting large American corporations. She was mindful that most American jobs are created by small businesses, and therefore worked relentlessly to open up global business opportunities for our small businesses and entrepreneurs. One of her signature initiatives was to mobilize Americans who were members of the diaspora community to reach out to their countries of origins and to work to advance and secure American economic interests as well as moral imperatives. Her seamless bridging of the economic, political and security dimensions of U.S. foreign policy has provided a more robust direction to our participation in the global economy. Economic statecraft may not be the flashiest side of foreign policy, but it’s important for economic development in America and around the world. That is why I have continued on in my career to conduct business here and abroad. Over the years, America has wound its way through periods of high global engagement and eras when we’ve taken a more isolationist stance. But our world is a better place when public servants like Secretary Clinton strengthen both our foreign policy and economic ties with countries around the world. It is a clear win-win. Ambassador M. Osman Siddique served as the United States Ambassador to Fiji, Tonga, Nauru and​ Tuvalu from 1999-2001.​ He has served on several presidential delegations, including the White House Conference on Travel and Tourism and the First Hemispheric Trade and Commerce Forum. The Damage Is Done: Trump and the Asia-PacificNorth Korea Talks: Getting Around the Sequencing ProblemKim Jong Un Grabs the Headlines At Home, But What Did Trump Get From the Historic Summit?John Bolton Enters the Trump Administration: What to ExpectWhat Will Mike Pompeo Bring to US-China Ties?